Our Learning Poster is displayed in every classroom and teaching space. Charleston Academy’s Learning, Teaching and Assessment policy is built on the key messages from the Highland Council Learning and Teaching Policy and Building the Curriculum 5, A Framework for Assessment. It builds on the strengths of effective approaches to assessment developed through Assessment is for Learning. Our policy is intended to further support planning, design and putting into practice learning, teaching and approaches to assessment within Charleston Academy. It supports a consistent approach from all at Charleston Academy to learning and teaching in order raise attainment. 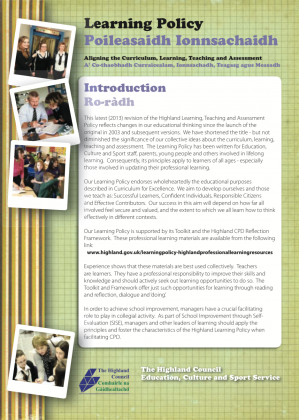 Together with the Highland Council Learning and Teaching Policy our framework provides an outline of the approaches to learning, teaching and assessment in tandem with self-evaluation (SISE) and supported by peer observations and pupil focus groups. Each department is represented on the Learning and teaching group, and members take best practice back to departments through Departmental Meetings to ensure the learning conversations are focussed. This develops a consistency of approach through the sharing of best practice. The discussion and use of learning approaches is discussed and shared at departmental meetings, a diary of topics is trailed by the group and then led by group members in their own departments. These are exemplified within class with practitioner examples and modelling of the approaches used. A bank of resources of LT&A in action is being developed. This is closely linked to our peer observation policy, and self-evaluation on the impact of learning on the practitioner and also the learner. 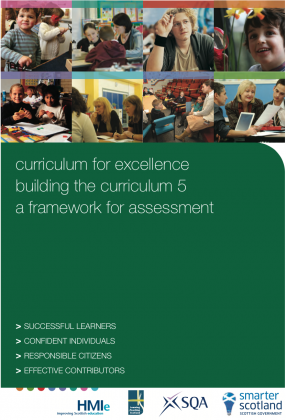 Assessment FOR Learning – supporting classroom learning and teaching. The starting point for the development of the Charleston Learning Policy was the work of Paul Black, Dylan Wiliam, Robert Fisher and others who contributed to the concept of the AifL School. The AifL triangle above continues to underpin our thinking about how a good school learns. This can be defined as ‘all those activities undertaken by teachers and/or by their students, which provide information to be used as feedback to modify the teaching and learning activities in which they are engaged’ (Black and Wiliam, 1998 – Authors of ‘Working Inside the Black Box’). they are fully involved in deciding what needs to be done next, and who can give them help if they need it. Participation – Sharing learning and success criteria. Teachers, pupils and parents need to share learning intentions and criteria for successful learning in language that they all understand. Discussion and dialogue. Pupils can develop a deeper understanding of their learning when they are given opportunities to discuss their learning with their teacher individually, or with their peers. Thinking and feedback. Quality feedback is essential for effective learning and teaching because it helps the planning of pupils’ ‘next steps’ in learning. Engagement. Pupils’ active involvement in formative assessment approaches can support them in learning to reflect on their learning and to identify where they need to improve. This is part of the cycle of assessment where pupils and staff set learning goals, share learning intentions and success criteria, and evaluate their learning through dialogue and self and peer assessment. Through this process learners are able to build knowledge of themselves as learners, and become aware of how they learn. Know how learning will be checked or assessed? Are able to demonstrate how well learning has taken place? Know the next steps to learning? These five reflective questions are the basis of our Learning Policy poster which is displayed in all classrooms and teaching areas. The policy and the meaning of it was introduced to pupils at assemblies during 2015.